The Hudson River and Manhattan skyline may be thousands of kilometres away, but a local artist has been in an empire state of mind as of late. Vernon’s Katie Brennan is about to have her work on exhibition in The Big Apple. Her work has been selected among that of other Canadian artists to be shown in the exhibition Beyond Borders: an Exhibition of Fine Art from Canada at Agora Gallery in New York’s Chelsea district. “It’s still all not quite real, the whole having work up in a gallery in New York; even when I packed up the paintings to ship to New York last week. I’m so curious to see how this all turns out. I really hope my paintings bump into some new, great friends out there, preferably ones with money,” laughed Brennan. It was through the marvels of the Internet that Brennan was able to connect with the gallery. “They emailed me to say they had seen my work on my website, and if I could send along some more images for them to look at. From there they reviewed what I has sent and accepted me,” she said. The exhibition features a body of work that Brennan began during a residency at the Banff Centre in the summer 2011. Since then she has spent time watching light dance across rivers, lakes and shifting through masses of clouds. 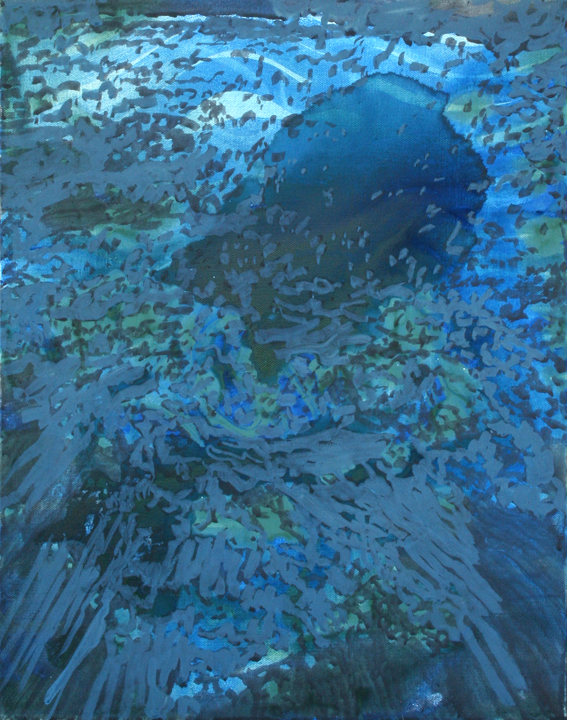 Her resulting paintings feature tracings from projected images of water patterns. 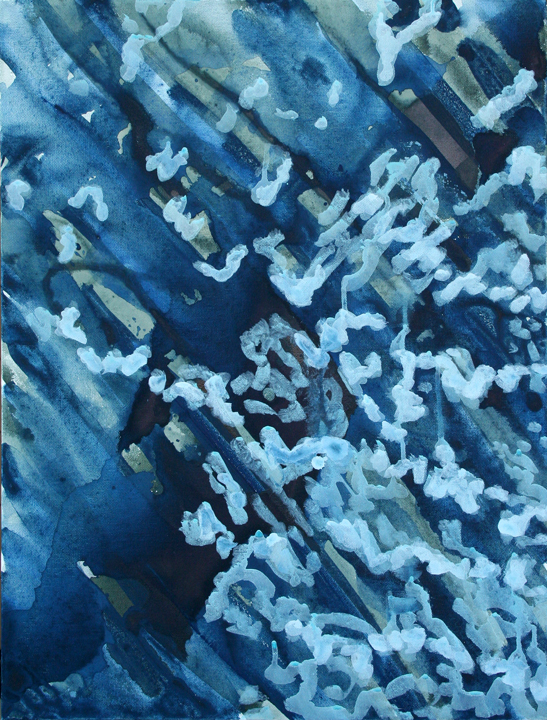 Working in gouache and oil, her technique of pooling paint and tracing lines cultivates images at once abstract and naturalistic. In her other recent works, Brennan has looked to the sky and the land, seeking to understand the awesome nature of these endless horizons. “The sky had captured my attention as another kind of large image space; one of infinite proportions and ever-changing imagery,” she said, referring to the hues of white and yellow pools that form billowing, amorphous shapes, creating the movement and ethereality of clouds. Brennan’s focus has also shifted down from the sky and into the mountains, which reveal an evolution in her process. “I use lines to trace out the land, to claim its awesome and subtle power,” she explained. Those who can’t make it to the New York exhibition can get an idea of Brennan’s work closer to home. Besides shipping her paintings off to the eastern seaboard, she is currently in the midst of getting ready to show a new body of work at the Lake Country Art Gallery. 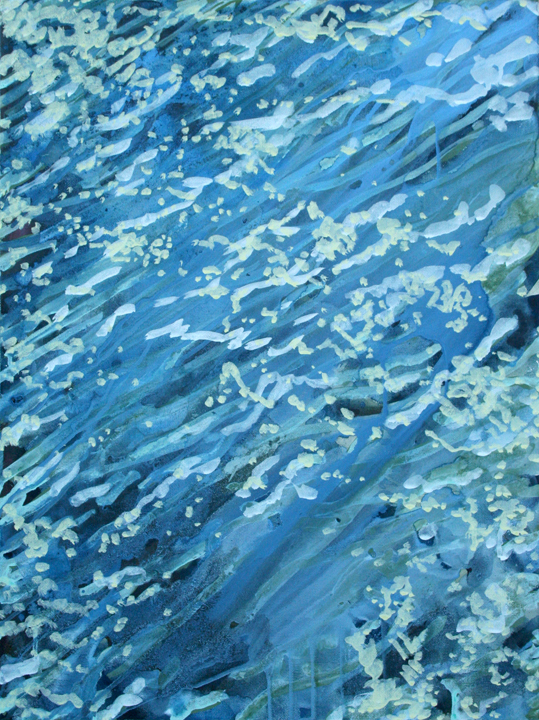 The show opens Oct. 12 and also features the work of fellow Vernonite Katherine Pickering. Entitled, The Limits of Seeing, “the paintings explore how we see, and don’t see, the world,” said Brennan. Brennan is currently the curator of the Lake Country Art Gallery. Both she and Pickering reside in Vernon and teach visual arts at the University of British Columbia’s Okanagan campus. Pickering has made a prolonged study of darkness for her abstract paintings, said Brennan. 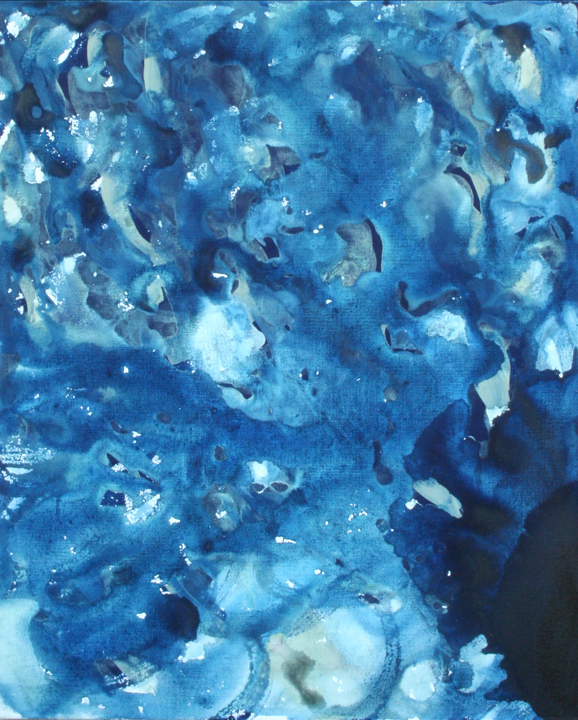 The Limits of Seeing opens at the Lake Country Art Gallery with a reception Oct. 12 from 7 to 9 p.m. Both artists will be in attendance. An artist talk with Brennan takes place Oct 17 at 7 p.m., while a talk with Pickering happens Oct. 24 at 7 p.m. Both women will be joined on Nov. 7 by Lake Country artist David Alexander for Painters Talking About Paintings, a conversation about painting. All events and openings are free and open to the public. The Lake Country Art Gallery is located at 10356A Bottom Wood Lake Rd. Regular hours are Wednesday, 10 a.m. to 8 p.m., Thursday and Friday, 10 a.m. to 4 p.m., and Saturday and Sunday, 11 a.m. to 3 p.m. Visit www.lakecountryartgallery.ca or phone 250-766-1299.